On the eve of the first day of the 2015-16 school year my 15-year old proclaimed at the dinner table that she planned on wearing the above pictured vest to school. It elicited two very different reactions from her two very different parents. Both responses were, frankly, predictable. I exhibited a somewhat controlled burst of joy, while my wife sat quietly for a moment with a look of distaste before blurting out a curt, ‘No.’ It would result in a brief, albeit slightly heated, discussion about ‘appropriate attire’ before I used what was, in hindsight, a completely ridiculous, totally amusing – to me and my warped sense of humor – and borderline inappropriate metaphor (especially for her younger siblings witnessing all of this at the dinner table) that essentially ended the conversation with eye rolls and head shaking. But I digress. Let’s start at the beginning. I’m a child of the 80s and in the 1980s heavy metal began to not only seep into the musical subconscious of society, but there began to be a sort of expected attire that came along with being a fan of this type of music. Long hair was a part of it. Ripped up jeans and white high-top sneakers were also highly accepted. But the #1 piece of the “metal uniform” was the Battle Jacket (or Battle Vest – also spelled Battlevest – if you decided to remove the sleeves). Like a lot of things in metal culture the Battle Vest was ripped off from bikers who used denim jackets and leather vests to proudly display the various emblems of their clubs. 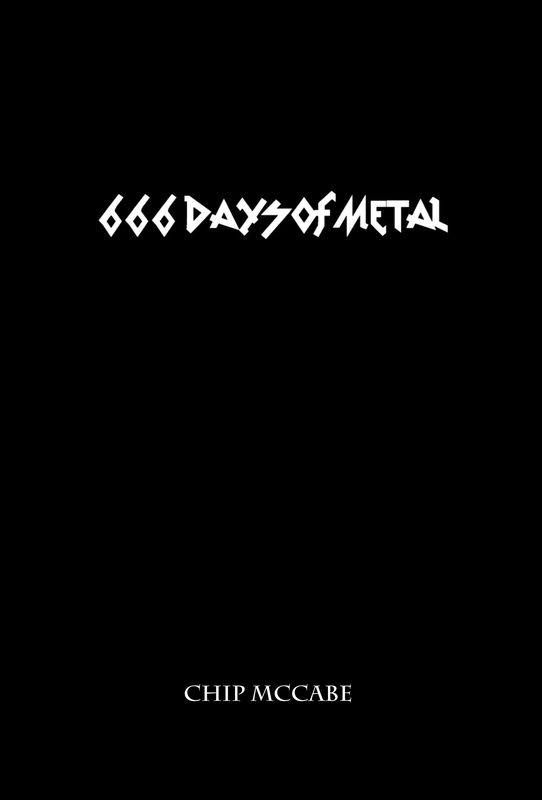 For us metal fans it was to proudly display the bands we loved the most. Before you ask, no, I did not have one at the age of 15. It wasn’t until I was 17 that my mother lovingly sewed an Iron Maiden patch onto the back of a denim jacket for me. And don’t ask what happened to that jacket. There was a period after I graduated high school where I swear I lost almost everything I owned for various, often nefarious reasons. The mystery of that jacket, my vinyl collection, and other assorted sundries is as deep and debated as what killed off the dinosaurs or the true identity of Jack The Ripper. It shall never be known but various conspiracy theories abound. Fast forward to when my now wife and I first started dating. It was the late 90s and by now the Battle Jacket/Vest had, for whatever reason, fallen out of favor with a lot of younger metalheads. Kids simply weren’t wearing them anymore in the droves they had been a decade earlier. Meanwhile, I had fallen in love with this military issued (New Jersey National Guard worn) shirt, or the “Army shirt” as everyone in my household would come to lovingly call it. It should be noted here that this shirt was a ratty piece of crap even then. Some later Googling would lead me to believe that by the time I came across this shirt it was already about 25 years old. But I loved that ratty piece of crap so much that I unceremoniously usurped it and wore it pretty much non-stop for 15 years despite a “bullet hole” (it wasn’t really) in the arm and my ever-expanding, Coca-Cola purchased waistline that meant I couldn’t even button the damn thing anymore without risking blowing off a button or two with a little over-exertion. 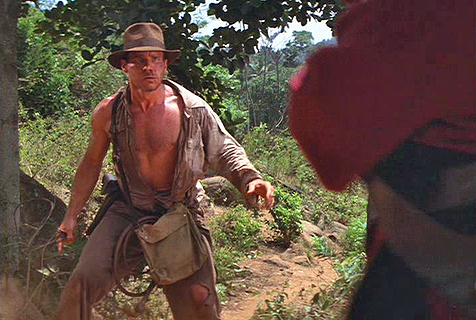 However my love for, what I still consider, the most comfortable shirt I’ve ever worn was unwavering…until that fateful day that I simply bent my right arm and with the most heinous ripping sound I’ve ever heard felt the cold air of my bare elbow protruding through tattered green cloth. It was crushing. The “bullet hole” was charming. This was now new levels of trashy I knew I couldn’t get away with. In my head I would wear that shirt until it kind of looked like this. By now the Battle Jacket/Vest had made a miraculous comeback, so much so that hipsters and celebrities were wearing fake ones adorned with made up band names. I didn’t care that they had become something of a weird homage to a bygone era. I began threatening to anyone who would listen that I would continue to own this beautifully maimed piece of cloth by cutting off the sleeves and sewing on patches from some of my favorite bands. Those threats were met in various ways. My wife would say things like, ‘You’re 38 not 13’ while my kids would egg me on, probably just to see what other insults mom could sling at dad. 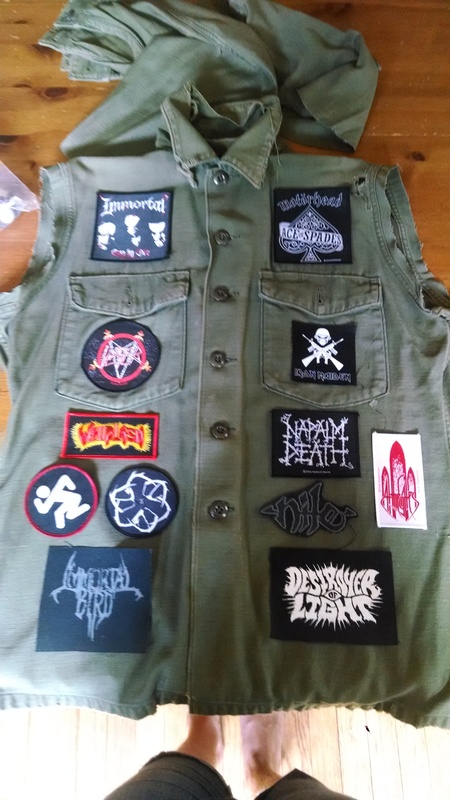 My very good friend decided to feed the beast and purchased a handful of killer patches for me of bands she knew I was a fan of. I was set to make it happen! Except…I can’t sew. So I waited, and waited, and waited. Finally this past summer my daughter found the shirt hanging glumly in the closet and asked if she could take the initiative. She would cut the sleeves off it and sew all the patches on for me. I knew right then what had to be done. I let her do it but instead of wearing it to the occasional show I would allow her to keep it for herself. After all, she was doing all the dirty work, so why not. It took her roughly three days but over the course of a long weekend she had completed her very own Battle Vest. When I told her that it was hers she was ecstatic. She had her own new favorite article of clothing. 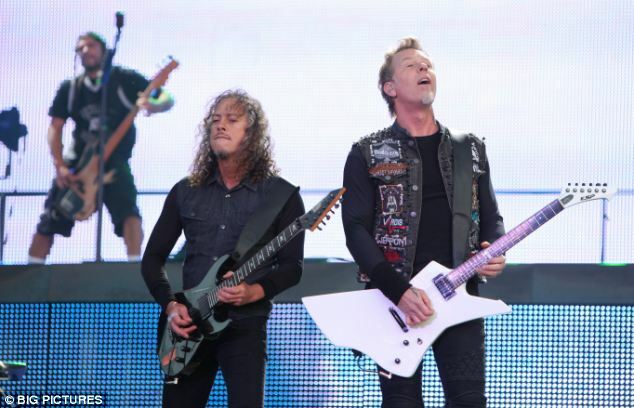 Pretty sure James Hetfield now wears the hipster/fake band vest. Because poseur. Fast forward again back to that dinner table announcement. My wife is shooting poisonous daggers from her eyeballs directly into my brain while I’m high-fiving our daughter. She is concerned what people – her teachers, her peers, etc. – will think when she shows up on the first day of school in this thing. I decided to approach this diplomatically. I said, “You know, your mother is right to an extent. When you wear something like that or even, say, your Amon Amarth shirt, you are like a convict on the first day in prison showing off your tattoos so the other prisoners know what gang you are affiliated with.” And there is was. A wildly inappropriate, real-life example that just lead to more fascinated questions from my nine year old than I cared to be a party to. My wife rolled her eyes so hard she basically just rolled right out of the room. The Battle of the Battle Vest was short and I was victorious simply because of my own stupidity. However there was a moral there I was determined to hammer home. People absolutely will judge you on what you are wearing or how your hair is styled or your facial hair or whatever. You will be judged at every turn, and by wearing metal-themed paraphernalia some people will make automatic assumptions (you must be a heavy drinker, you definitely smoke pot, you probably worship the Devil) but as long as you enjoy what you see in the mirror every morning, as long as you are comfortable in your own skin, (and for our children, as long as their attire is age appropriate) those other opinions don’t matter. They just don’t matter one bit, especially when it comes to something as innocuous as a Battle Vest. If any of my children had come to me and said they wanted to wear booty shorts and a shirt that said “I Like To F*ck” then we’d be having a much longer and more serious conversation. But this? This shirt with logos from bands we share a love for? No, this was not worth fighting over, not in my mind. So my beloved shirt lives on and my daughter has gotten dozens of compliments from fellow metal fans, including one kid who gave her a ton of new patches he screen-printed in school.